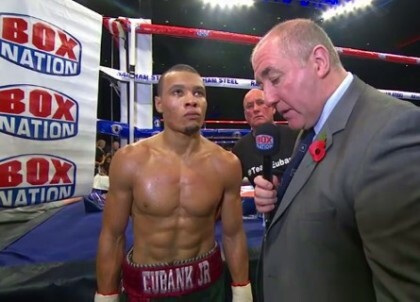 By Scott Gilfoid: #9 WBO Chris Eubank Jr (18-0, 13 KOs) plans on giving #2 WBO Billy Joe Saunders (20-0, 11 KOs) a beating on November 29th to take his British and European middleweight straps when they face each other at the ExCel Arena in London, UK. Eubank Jr, 25, wants to shut Saunders’ trap, because he’s been talking a lot of trash about him, and he wants to expose him and make him eat his words. Eubank Jr also wants to send Saunders into a permanent retirement, because Saunders has been talking about retiring if he loses the fight. No one knows for sure if Saunders is just blabbering just to get attention or if he’s indeed serious about retiring if he tastes defeat for the first time. If Saunders does retire then it suggests that he’d thought more of his own talent than some of the many boxing fans think of him. Saunders is a decent fighter, but he’s not seen by a lot of boxing fans as the next Gennady Golovkin. “It’s a big fight. It’s one of the biggest fights Britain has seen in a while,” Eubank Jr said about his November 29th clash against Saunders. I think it’s going to be bigger than [Dereck] Chisora vs. [Tyson] Fury, because this is the next generation. He’s [Saunders] said some strong things, and he’s going to need to back up his words. He’s not professional. He’s not professional, and he’s not worthy of being called the British champion. He doesn’t represent Britain like I’ll represent after I take the belts off of him. This guy is going to be in serious trouble on November 29th. There’s going to be a lot of that [cuts, bruises and a broken nose] on November 29th, but it’s not going to be on me,” Eubank Jr said. Eubank Jr is coming off of a 2nd round stoppage win over Omar Siala last Saturday night at the Echo Arena in Liverpool, UK. For Saunders’ part, he stopped Emanuele Blandamura by an 8th round knockout last July. In analyzing the fighting style and relative talent of the two fighters, I have to say that Eubank Jr looks to be the better fighter by far compared to Saunders. Eubank Jr is faster, with more power, and he’s more athletic than Saunders. He’s also the better fighter defensively. Saunders lacks the power to win this fight, and he’s a real hot-heat with the way he gets all worked up. I just don’t see this going well for Saunders. Eubank Jr has too much talent for him, and I can see Saunders losing his cool and getting knocked out on November 29th.